Time moved on, and Elohim desired to reconnect the disconnect between Creator and creation. He introduced into many cultures, the sacrificial system. In this system, it was understood that a blood sacrifice was required to pay the wages of sin. In many ceremonies, animals such as sheep, would have have human hands laid upon them in a symbolic transferral of sins to the sacrifice. The animal would then be sacrificed in a ritual of human spiritual cleansing, giving those in whose place the lamb had been sacrificed a cleansed spirit - a new lease on life! Spiritual Law That Rules the Universe #2: From death comes life (contemplate this the next time you sit down to eat; take a look at your plate - what is there was once alive, but is now dead, so that you may live... plus, thinking about dead cows at meal time is also a good way to loose weight). In the scheme of things, it really didn't take long for humanity to turn the sacrificial system into mere ritual. Elohim wanted a reconnect, not a ritual. So He chose an ordinary man, known as Abraham, to do something quite out of the ordinary. Elohim, introduced Himself to Abraham as Yahweh, the Breath of Life, and told him that he would have many descendants, and that all the nations of the world would be blessed through him and these descendants. Abraham had sons, and his sons had sons... one became known as Israel, and a great nation was to take his name. The people of Israel found themselves in slavery in Egypt - all of them, the whole nation. They cried out to the God of Abraham for help. He heard their prayers, and sent plagues. Odd answer to prayer you say? Perhaps. The famous 10 plagues of the Old Testament of the Bible... the last one being the death of the firstborn of every house in the land (Yikes! And, as a first-born, I mean that!) God remembered His promise to Abraham by providing a method of protection for the people of Israel during this plague: sacrifice a lamb; then cover the frame of the doors to your houses with the blood of the lamb. The plague of death would then Passover any household covered by the blood. When all was said and done, Elohim instructed the people to celebrate every year this event which led to a mass exodus from Egypt - they called this Passover (catchy, hunh?). Spiritual Law That Rules the Universe #3: From obedience comes freedom (try explaining THAT to your teenager!). More than 1,200 years later, from the descendants of Abraham, the nation of Israel, the tribe of Judah, and the line of David (all ancient prophecies, by the way) was born a most unique individual named Yeshua. Yeshua became a teacher (the Jewish word is Rabbi) and had quite the following. He celebrated all the traditional feasts, including Passover. The thing is, the feasts had become just that - tradition. Just as with the sacrificial system, the feasts to remember system had become mere ritual. Elohim wanted a reconnect, not a ritual. When Yeshua was in His early-30s, He celebrated the Passover for the last time (you may have heard of the "Last Supper"? This was it.). As a part of the Passover meal, the head of the household, in this case Yeshua, would say a specific prayer, then break in a specific way some bread, which had been made a specific way... then he would hide a piece away and pass the rest to be eaten. Then he would pour a specific cup of the juice from the fruit of the vine, while saying yet another specific prayer... then pass the cup to be drunk. They did this to remember that time so long ago that God had delivered them. Then Yeshua does something new - He tells his friends, family, and followers that when they eat this Passover bread and drink this Passover cup, to do it to remember Him and announce what He has done and what He is going to do! One might imagine awkward looks on their faces as He tells them that the Passover feasts for over a thousand years have not been pointing back to the Exodus from Egypt, but forward to the Crucifixion of the Messiah. The sacrificial system pointed forward to Yeshua. The feasts to remember system pointed forward to Yeshua. Yeshua was executed on a Cross, His body was broken and His blood spilled. A physical moment with intensely spiritual significance. Spiritual Law That Rules the Universe #4: We are meant to be connected! And now, 2,000 years after the days Yeshua walked upon this earth, all nations have been blessed through Him. All of us have the opportunity to be reconnected. God's plan is, and always has been, to reconnect the big disconnect in our lives. Yeshua, Jesus, was a most unique individual because He was born to a virgin (at least that's both of his "parents" said)... He was God in the flesh. What He did was the most amazing act of love anyone could possibly ever do. 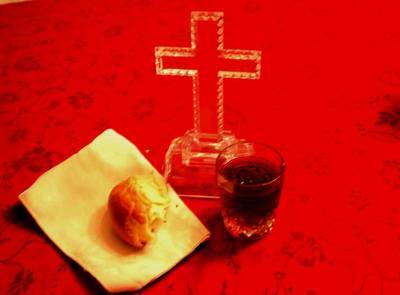 Some wonder, "why do followers of Jesus, every so often, eat itty bitty pieces of bread and drink itty bitty cups of the fruit of the vine?" It is to remember and celebrate that we are all connected. May your Communion with your Creator be a spiritual reality... not a mere ritual.